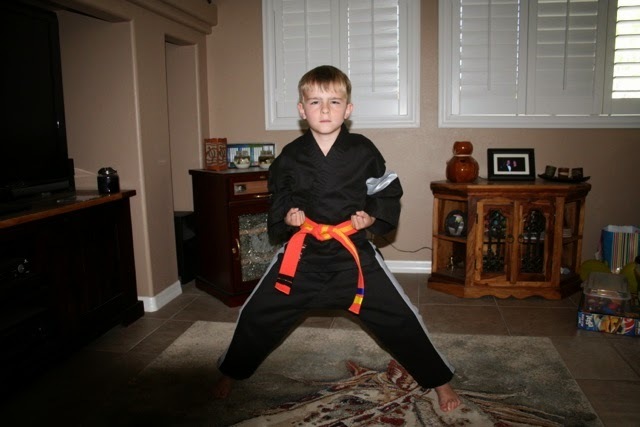 Following up from my last post, Paul has taken another step in his development as a martial artist and in his growth as a young man. 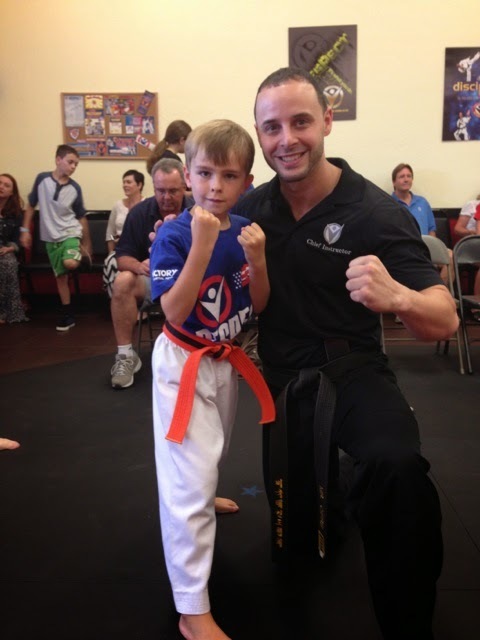 Not long after Paul earned his Orange Belt, our Chief Instructor talked to Steph and I about placing him into the Victory Martial Arts leadership program based on the potential he shows in class. Around that same time, there was a special demonstration and instructional event hosted by the Victory schools here in Las Vegas, featuring several senior black belts from Orlando, Florida (the home of Victory Martial Arts). During that event, Paul also caught the eye of the visiting leaders and we consented to have them publicly invite him to enter the leadership program. A week later, at our school, one of the Chief Instructors at our school announced in front of his friends that Paul had joined leadership. 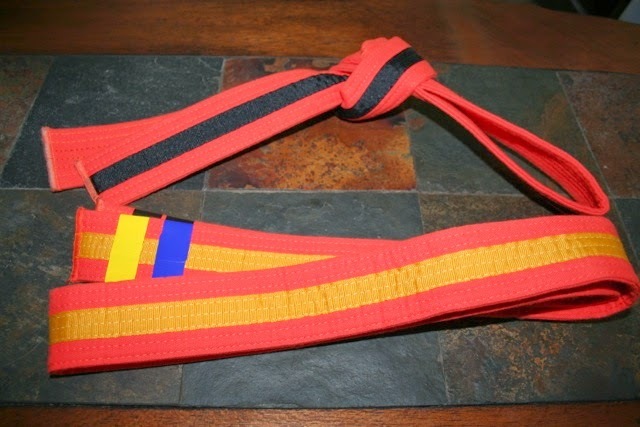 He received a new belt representing his participation in the program (an Orange Belt with a gold stripe in place of the usual black stripe), and a new leadership uniform. Since then, he attends an additional 30 minute training session twice a week following the normal Beginner’s class. It’s fantastic. In these sessions he trails with the small group of other leadership students in a more difficult, but also more fun, class. While the practical focus is on more advanced knowledge and discipline, more complex forms and additional weapons, the goal within the school is to develop these kids into martial arts leaders as they work toward black belt. As Paul continues to advance in rank he’ll attend his usual training and leadership lessons, but he’ll also start help the instructors when they teach the beginners class. He’ll directly apply what he’s learning as he helps other students. The character traits taught and fostered through Victory Martial Arts are: Respect, Self Esteem, Communication, Discipline, Honesty and Belief. 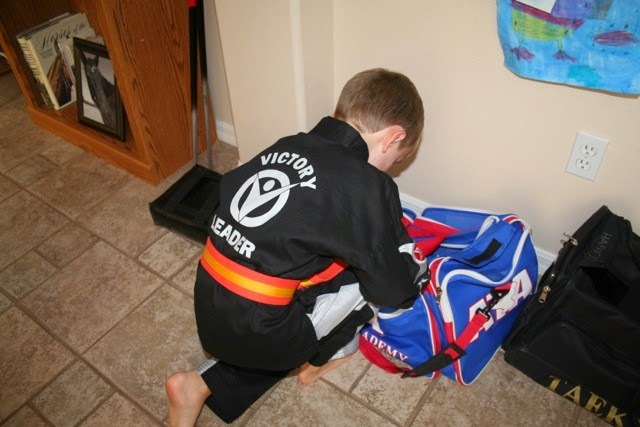 As important as these are in the practice of martial arts, it’s more significant that the knowledge and practical experience Victory provides for the kids is intended to directly translate into a positive attitude and a lifestyle of action in the child’s behavior and performance at home, in school and eventually in their jobs and all of life. After only three months we already see these life skills carrying over into the Paul’s life at home and at school. On a humorous note: recently we were leaving a restaurant with Paul. As we reached the door, he quickly turned back to face our server and the folks who work there and in a strong voice thanked them by proclaiming, “Goodbye Sir, Goodbye Ma’am!”, then stepped outside. It was already habit to be courteous and show respect to those who had just helped (or in this case served) him. Obviously this wasn't required ore expected but the habit carried outside the school. We were amused and very proud at the same time. This has been a great time striving toward a goal as father and son! We’re less than a month away from testing again. This time Paul will test for his Yellow Belt and I’ll test for my Orange. And not too long from now, Steph is going to join us in the program too. 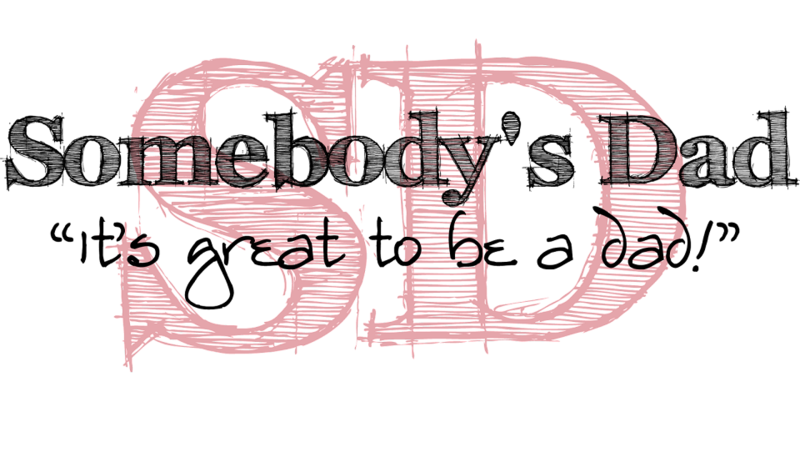 What an amazing addition to the things we do throughout the week to build and strengthen the bonds that tie us together as a family through shared experiences, struggles, and striving together toward a goal. In the process we’re also getting more fit, and we’re making some amazing new friends as a family!